While many cruise ships reposition come spring time to itineraries far away from here, this is the time when most of them go out of Florida, and Holland America has quite a few that come and go through Port Everglades in Ft. Lauderdale. And if you fly in, the port is less than a mile from baggage claim and plenty of taxis and buses are handy. For instance, lots of folks booked a cruise on their Zuiderdam which went out on the 16th of January for an 11 night cruise all the way down to the Panama Canal. Cabins come in various styles, with the upper deck suites at a larger price for larger quarters; and all the way down to Interior cabins, which provide sleep areas, baths, and some other amenities for quite a bit less money. Then you may chose other mid-ranges such as an Outside View which may be same size but has a window, or better yet the Verandahs, which are a bit larger and have a private porch where you can sit, view the scenery and imbibe in quiet pleasure. Let’s say you booked a cruise such as this for maybe $1500. What do you get? A hotel room, daily first class service, fine posh meals in the main dining room and day-long buffet grub if you want to go that way. Then you also have bars with music, concert halls, a casino, a jazz hall and dance area and a huge theatre with professional shows. For instance, on this cruise the Main Stage presented incredible Canadian comedian, Scott Harris, and he brought the house down. Generally the performers do two shows a night so that everybody gets a chance to see it, whether they dine early or late. On the next night they presented an energetic show called One World, performed by the Zuiderdam’s singers and dancers. And for movie fans they presented Bohemian Rhapsody on their huge LED screen. Another night they brought back the renown Island Magic Steel Band from Trinidad and Tobago. And if you wanted another large scale song and dance review they brought back the singers and dancers for a show called 1,000 Steps. Not enough entertainment? Well they also presented a gold medal winning illusionist, James Cielen whose work was top grade Vegas quality. And for the film fans and music fans one evening they presented Planet Earth II, a famed BBC production, on the huge screen with a live orchestra providing the music. Like music? Well they also brought to the stage Sonia Selbie a super-active singer with great pipes who knows how to work the audience. As the cruise drew to a conclusion they presented a Billboard Off The Charts groups of hits from Elvis to Beyoncé. Finally, on the last night before you had to go pack up, you got to attend a Variety Show which brought back some of the top performers for an encore performance. So do a little math. Eleven evenings of theatre which might cost maybe $50 a night, and 11 nights of top class cuisine and service, which might also run a tab about $50. And a hotel that you couldn’t get in south Florida in winter for less than $150 a night. Duh! Now you see why this is such a great deal. Then be sure to add in that you would have visited Curacao and Aruba and entered the Panama Canal up to Lake Gatun and back. Beats watching the news and listening to politicians. Oops . . . know that they have large screen TVs in each cabin with live TV, films, and channels where you can view what’s going on in the world. Bottom line is that if you really want to get out of town, to someplace where there is total care available and the only decision you need to make each day is what do you wish to order for that fancy dinner; then you need to pack up and get ready to sail away. 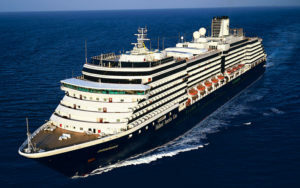 Get loads of info at HollandAmerica.com, and you can sign up for their special deals should you wish to do so.